The Pacproinc® PPI-200 Counter/Stacker automatically counts and stacks flat breads and bakery thins in single- or multi-lane operations. The system also auto loads trays or horizontal flow wrap machines, and the modular design can be easily customized to fit your processes and products. Our PLC design allows for easy production setup, changes, and networking with other equipment. The PPI-200 Counter/Stacker easily integrates with any Pacproinc® Interleaver. The paper, film, or foil sheet can be folded or wrapped around the product for ease of separation, sanitary handling, freeze release, improved shelf life, and portion control. All of our solutions are available as a combination interleaver and stacker or as standalone components designed to fit your application. The PPI-200 product line is a sanitary, washdown-duty, stainless steel system. The streamlined design incorporates leading-edge Programmable Logic Controller (PLC) and servo motor technology, ensuring low maintenance and a long machine life. With compact designs available, the PPI-200 requires a minimal amount of floor place and is engineered to exceed the American Meat Industry’s 10 Principles of Sanitary Design. Don’t need interleaving? No problem. Pacproinc® offers a variety of modular counter/stackers to fit any application, and our custom design easily interfaces with upstream production equipment and end-of-line packaging machinery. 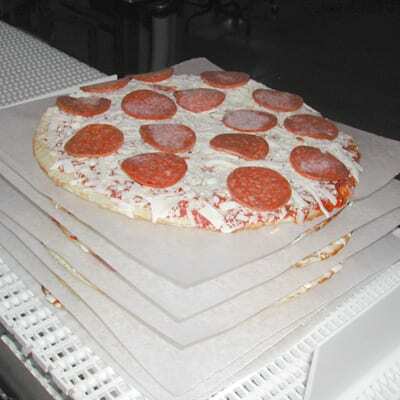 Designed by Pacproinc® to automate the counting and stacking of pizza crusts, this system is capable of independent lane operation at speeds up to 100 pieces per minute per lane. As with all Pacproinc® solutions this system is available with custom in-feeds and exit conveyors. Regardless of your packaging requirements or upstream processing equipment Pacproinc® can offer a fully integrated solution.